On thursday, Thanksgiving, we were at home, just two of us, having somehow forgotten to arrange the small dinner party we would normally have enjoyed on that most social (and refreshingly secular) of holidays. We had squab, but before the squab, a treat which I have to call even more special; we shared a first course of oysters from Walrus and Carpenters, an oyster farm on the north shore of beautiful Ninigret Pond, which is almost at the very bottom of Rhode Island’s South County, one of my favorite places. We opened five dozen last New Year’s Eve, when I didn’t have to do much in the way of preparation for the light meal which followed. This week I decided that the two dozen (actually 25) would represent the better part of valor if I was going to turn return to the kitchen to prepare a more ambitious meal afterwards. 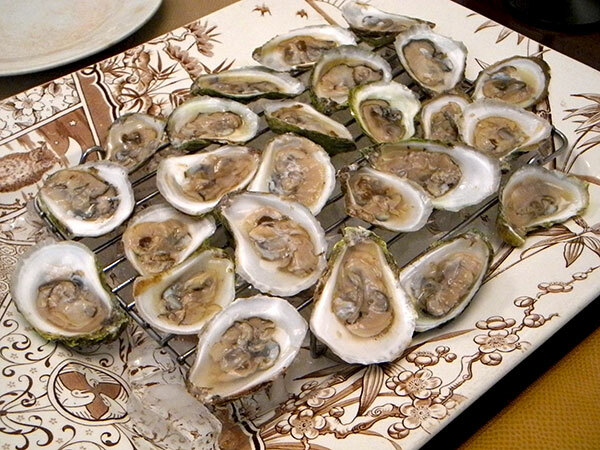 Whatever reason, I think the oysters were even more delicious this time than they had been last December, and they were superb then. We had picked them up from Jules Opton-Himmel, the young ecologist who created and farms the beds, the night before, and they had been harvested the day before that. The drop off site was the roof of his mother’s loft building on Lower Broadway, where we shared beer and a few oysters with Jules, Joanna, mom, and other customers who had come out in the rain to collect a share of the November harvest. We plan to order more in December, if possible, on each of the next Manhattan dates, December 12, 23, and 31, and we highly recommend that any local oyster fans who are listening do the same. They also show dates for pick-ups at Brooklyn Kitchen on their site. 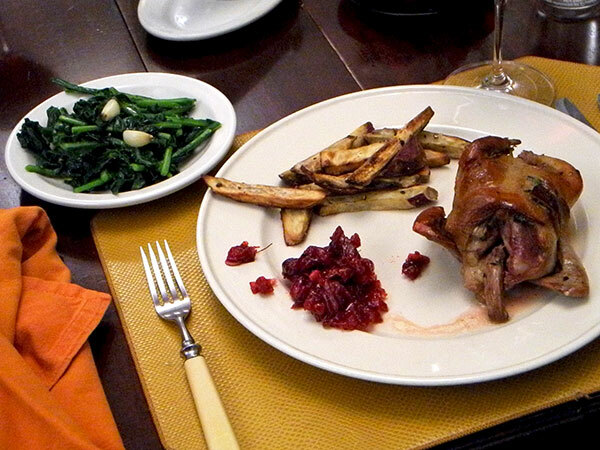 The bivalves were followed by roast squab from South Carolina dressed with their own sauce, cranberry chutney, sweet potato oven fries, and winter radish greens braised with a bit of garlic. Dessert was mince pie with goats milk vanilla ice cream on the side. As always, everything but the oysters themselves, and the birds, came from local farmers selling in the Greenmarket in Union Square. 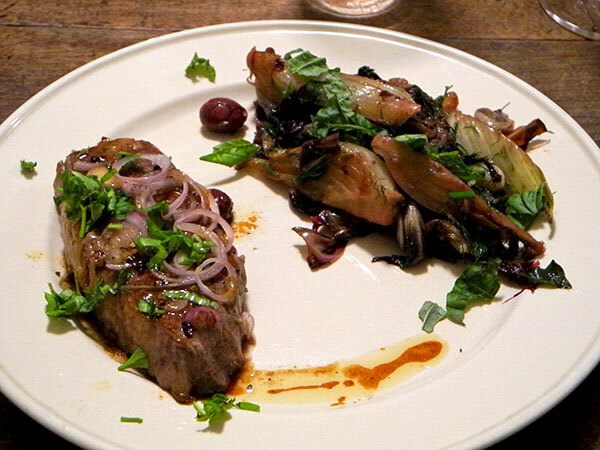 The pork chops were superb to start with. They had a good layer of fat, they were modest in size, and they came from Flying Pigs in the Greenmarket (now doesn’t that phrase sound interesting?). Like the one for the greens, the recipe was incredibly simple. 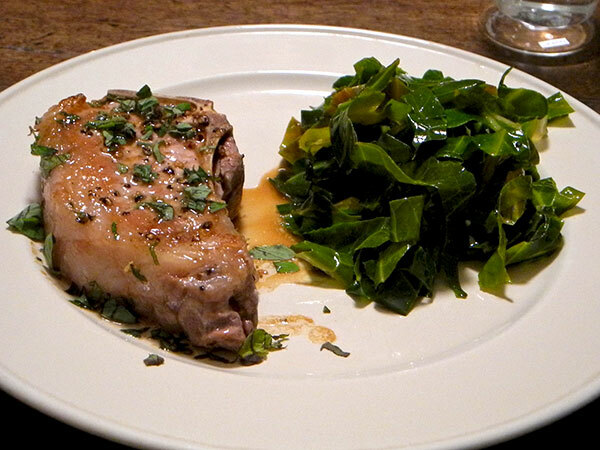 That for the pork chop was once again from Rose Gray and Ruth Rogers’ “Italian Easy: Recipes from the London River Cafe“. 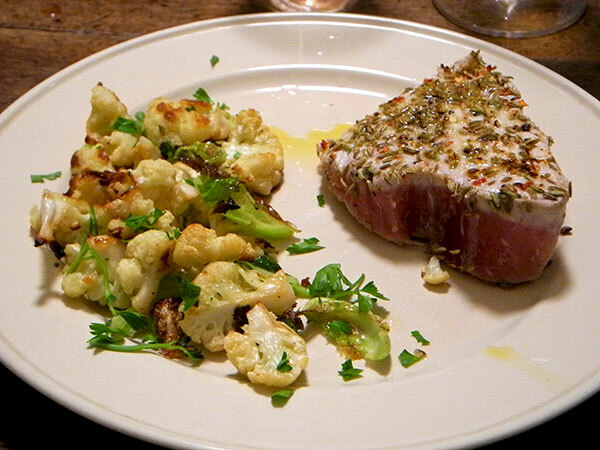 We never get tired of this simple Rose Gray and Ruth Rogers recipe for tuna steak, or of the pleasure in pairing it with something different each time. Here it was some excellent white cauliflower, one of our favorite vegetables, also prepared just about as simply as possible. This entrée is looking very wintry; fortunately today’s weather pretty much went along with the fiction. By further explanation, I’m trying to wind down the larder before we ship off to Washington this week for five days, so I’m assembling some atypical combinations for dinner. I immediately thought that I liked the combination of ingredients in the Mark Bittman recipe for this entrée, but I quickly had second thoughts. What happened is that I had picked up some uncommon Honey Butternut squash (which the farmer called ‘Sweet Melissa’) at the Greenmarket earlier in the week, and a few days later, anticipating the much welcomed return of cod to the Greenmarket and mindful of the sudden chill in the air, on Friday, before heading to Union Square I had searched on line for suggestions for combining the two. As I just said however, after examining the simplicity of the recipe (and especially after seeing there was absolutely no greenery involved), I had my doubts about its ability to sustain any real taste interest. I was wrong, and in retrospect I don’t think it was only because I had decided to add some chopped parsley to the dish after it was assembled. It’s a wonderful recipe. Just pick out a fresh herb, and make it even better. 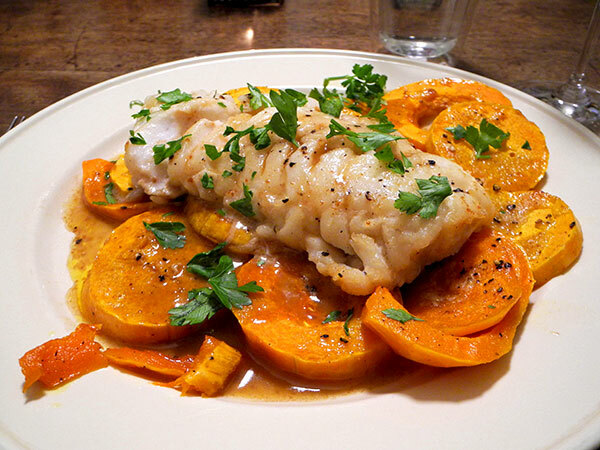 Think sweet-and-sour sauce marrying a great winter vegetable and a noble fish.